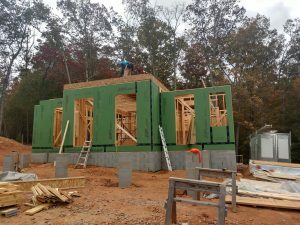 Check out one of our projects, currently under construction in Fairview, North Carolina! Located on a beautiful piece of property, slightly elevated to take in the pleasant views of the mountains and country side surrounding us here in Fairview, North Carolina, we have recently begun construction on this adorable house! It will have a “farm house” feel… with 10 foot ceilings on the main level, a vaulted ceiling in the master bed room, and exposed timber beams to enhance its charm, while at the same time utilizing energy- saving building products and design features. These will include having some of the more prominent windows facing south for passive solar, 2×6 exterior walls for greater insulation R- value, as well as adding foam insulation in selected roof areas and in the floor bands. One other design feature includes a “sealed crawl space”, which will contribute to it being a healthy home. Sealed crawl spaces help eliminate musty odors from this area, while at the same time increasing the over-all energy efficiency of the home.